Fate and near supernatural circumstances throw two young lovers into a harrowing situation where they must rely on each other for survival. Barely surviving a ruthless shooting in his Montana hometown, sixteen-year-old Alex Fahlstrom awakens from a coma only to find that his memory is compromised. In an attempt to build a new life that has no semblance of their roots, Alex’s family moves to Kansas City. Lost and emotionally adrift in this new town, Alex seeks comfort from a cast of eccentric high school strangers, including a rebellious, rock-loving partygoer and his intriguing twin sister. Alex falls for Danielle, and as he gets sucked into her brutal family drama, he begins to unlock the secrets to his own past. 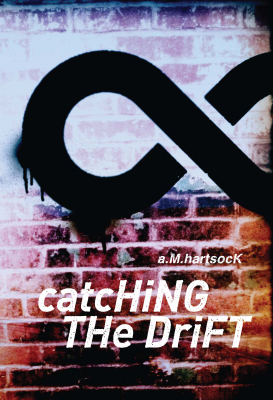 Set amidst the grunge and angst of the early 1990s, A. M. Hartsock’s Catching the Drift is a twisted tale of a romantic relationship gone horribly awry. Told completely through the perspective of Alex and his girlfriend, Catching the Drift leads the reader through a maze of intrigue and misunderstanding, shifting from a placid suburban neighborhood to open skies and majestic mountains – from dreaming to waking. Pay attention. Nothing is what it seems in this startling novel that explores the metaphysical reality of individuals navigating between their inner and outer worlds.